America can’t even spell “Super Bowl” correctly. Google Trends proves it. 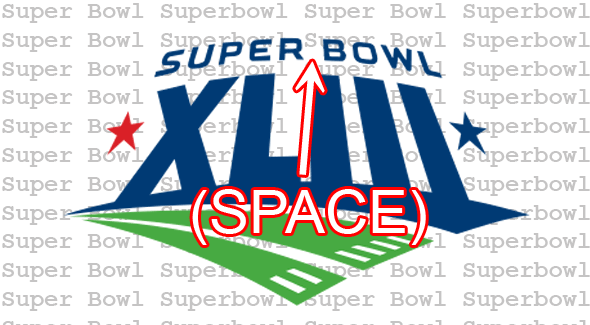 The day after the game, when our “Superbowl” podcast hit the site, I noticed that our editor had chosen to spell it in one word, as opposed to the standard “Super Bowl.” At first I thought nothing of it; I just attributed the variance to his self-professed ignorance of all things football. But then I noticed the “Superbowl” spelling popping up all over the internets, from Cinematical to the Belfast Telegraph. Even the Wall Street Journal got in on the act. Fear began to overcome me. If the all-powerful media, with its copy checkers and style guides, was getting it wrong, what, then, of the general public? 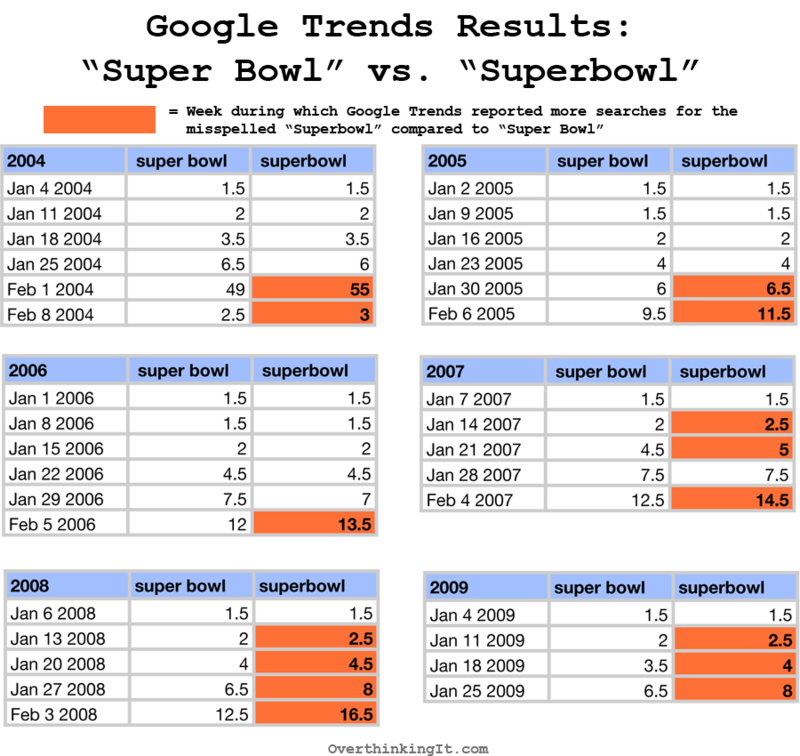 Google Trends (an infallible source of knowledge) confirmed my worst fears: as a search term, “Superbowl” has pulled ahead of “Super Bowl.” America officially can’t spell. Yes, I realize this is teh inturwebz, where mangling the English language is par for the course. But I had faith that Americans would at least take the time to spell “SUPER BOWL,” that most sacred of all American days, properly. I was wrong. Readers, what do you think? Is this a new American Spelling Crisis, just another case of language evolving, or somethingmuchworse? i noticed this crap sometime ago, and now i see it everyday. the simplest explanation for this phenomenon is that some viewers are more informed than others. the high-information fans pay attention all year; they might or might not have fantasy teams, but they certainly watch football every week, so they are more likely to see “super bowl” in writing and to recognize it as a two-word phrase. the low-information fans, who might enjoy watching a game now and then but certainly don’t play in fantasy leagues, rely more on word-of-mouth and are less likely to know that the game is two words. the high-information fans will perform google searches year-round, perhaps out of interest in this year’s possible contenders, or perhaps out of interest in historical stuff. but the low-information fans are much greater in number, and their interest peaks in the week or two surrounding the super bowl. hence the annual spike in misspellings. I don’t think it’s lazy. I think it makes perfect sense. Especially if you’re not a huge football fan and/or overthinker. I think it has to do with a theory of mine, that football is replacing (if it hasn’t already replaced) baseball as America’s pastime. As sarielthrawn said, the Big Game has become an event in itself- it has penetrated pop culture and society enough that even non-football fans talk about it and are at least vaguely interested (I mean come on, count the number of people you know that watch it “only for the commercials,” for example). As such, it’s probably a combination of its popularity and how (American) English massacres so much over time- Hell, I could have said “everything” right there, and isn’t that an example of something (AAAAH!) being changed? The totally underthought solution is, of course, to just look at the official logo or website (why is THAT one word?! ), where it is clearly two separate words. Then chock the discrepancy up to the ignorance of the uncultured masses and there you go- you’re an elitist NFL fan because *you* say/think it right and *they* all have it wrong. This, of course, opens up a can of worms regarding bandwagoning and such, but I digress and, as is my wont, have strayed into topics unrelated once more. Surely the NFL’s trademark on “Super Bowl” is to blame. I don’t remember being reminded to tune in to the Cottonbowl, Bcschampionshipbowl, or Rosebowl this year. This is simply the evolution of language into a new and more efficient form. The constant proliferation of bowl games has been a tax on our memories and vocabularies for too long (the PapaJohns.com Bowl? Really?). Under the new system, this irrational taxonomy can be done away with: from now on, there will simply be bowls, superbowls, and doubleplusunsuperbowls. How about the Lingerie Bowl? Too bad it was canceled this year, eh? Normally not one to comment, but the banner ad on my page right now is from NFLshop.com and advertises “SUPERBOWL CHAMPIONS Steelers Gear”… interesting. Maybe it’s not just the viewers after all? As an English teacher, I’m always horrified by the toll the internet and texting are taking on my students’ spelling skills. I’m continually saddened to find that adults have been affected as well.